Our banquet facility can accommodate your special event: wedding reception, bridal shower, baby shower, funeral luncheon, anniversary party, birthday party, family reunion, class reunion, fund-raiser, craft show, holiday party, graduation party, quinceaneras, retirement party, corporate meeting, and out door space available. We work closely with you to make your event successful with no worries. 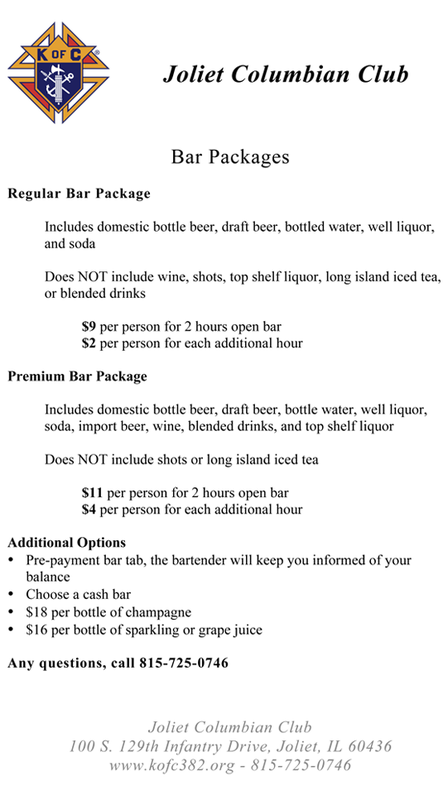 The Joliet Columbian Club offers 2 different bar packages to our customers. We have a regular bar package and a premium bar packages. Our bar packages provide you with a pre-payment bar tab where our bartenders will keep you informed of you current balance. Both packages include domestic bottled beer, draft beer, bottled water, well liquor and soda. You also have the choice of opting for a cash bar. We provide our guests with various catering packages. All our catering is done by Doing Thyme Catering. Adults above twelve years of age get to pick between a two or three-meat buffet. Children between the ages of six and eleven eat at half price and children under five eat for free. We allow for guests to use their own caterer for a price. 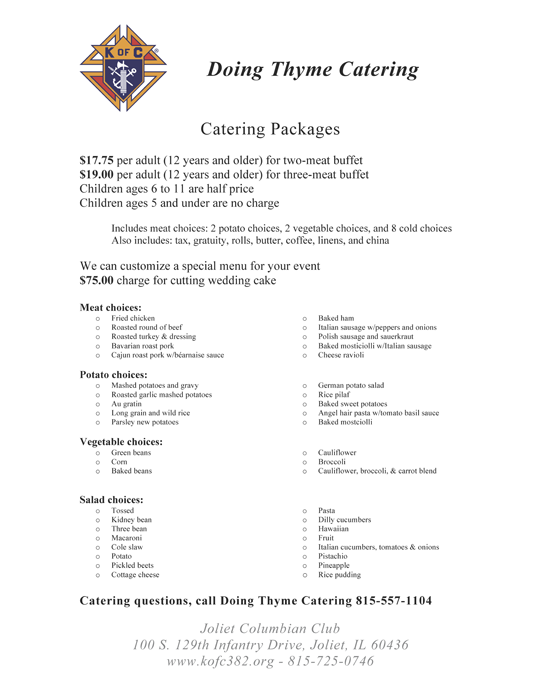 For questions about our in-house catering, call Doing Thyme Catering 815-557-1104. You pay half the rental price of the hall. Our caterer and staff are here, in house, to answer all your needs. No set up or clean up, just walk in and enjoy your party. No hidden fees, taxes or gratuity. The price you are quoted is the price you pay. Your get real china and silverware, not paper and plastic. You get cloth napkins and table clothes, not paper or plastic. We provide assistance with decorating. Your get a chef with over 37 years of restaurant experience. Our catering team has over 18 years of restaurant experience. Our catering team has over 18 years of experience in this facility. You are assured your food is always fresh, made in house. Hot foods are hot and cold foods are served cold. No risk of ruining your clothes or car by carrying in your food. You can be sure that no one will ever go away hungry. We have NEVER run out of food. Can your outside caterer promise you that? If your guests have special dietary needs we will work to accommodate them. Just walk in, relax, and we’ll take care of everything.